Every child should be able to experience the joy and tradition of trick-or-treating on Halloween. But kids with food allergies (and other food related issues like diabetes and swallowing issues) are often left out of the fun, since most candy is off limits. 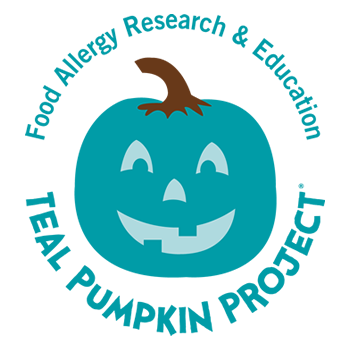 Food Allergy Research and Education (FARE)’s Teal Pumpkin Project helps make sure all children will come home on Halloween night with something they can enjoy. It just takes one simple act: offering non-food treats, such as glow sticks or small toys, as an alternative to candy. This is a worldwide movement to create a safer, happier Halloween for all trick-or-treaters. You can read more about this movement and how it began on FARE's website. Participating in The Teal Pumpkin Project is easy as 1-2-3. First, purchase or paint a teal pumpkin to display at your home. This lets families know that you will have non-food treats available. Next, purchase non-food treats to hand out on Halloween night (see ideas, right). Last but not least, share and be aware! You can let friends and neighbors know that your family will be participating in The Teal Pumpkin Project by printing a free sign from FARE and sharing information about The Teal Pumpkin Project with others. What kinds of treats are best? FARE offers an extensive list, here. Many of these treats are available at local stores, such as Target, Walmart, and dollar stores. You can also purchase treats online through Oriental trading Company.